Li Songsong was born on 1973 in Beijing, China. He lives and works in Beijing, China. His painting was the kind of iron candy boxes he played with when he was small. Its title was "Beijing Candy." There was another one called "Digging," which depicted some soldiers digging trenches. He painted above two paintings between 1997 and 1999. At that time, he just graduated from college and had not much to do at home so he painted those. This way of thinking was not especially active back then. He made "Horse" in June 2001. He started to paint these paintings during that summer when he found some old photographs. Originally he wanted to paint something that had a certain distance from reality. He thought to construct a scene in painting, representing things or a certain sentiment from our real life, was not so interesting. The painting of the soldiers digging the trench, for example, was a picture he saw by chance. He felt attracted to the process of looking at photographs. When he looks at pictures in a book, he usually turns them over when we understand the meaning in them. He painted this picture probably because He looked at it so closely. It was a very plain photograph: some people in uniform were digging into the earth on a wasteland. After he read the explanation, he realized that the people were voluntary soldiers digging a trench during the Korean War. If you look at an image long enough, you will discover other meanings in it. He had also painted images from TV, the portrait of the late Deng XiaoPing for example. At the time when he passed his portrait was on TV every day. I took a picture of his portrait and painted it. But he didn't continue with this kind of topics, including the one of the candy box. Perhaps he wanted to paint some existing and ready-made things at that time. But he didn't want to sketch a person in a conventional type of space. He wanted the original image to be something one dimensional. Conclusions: Li Songsong had already established his own style and the impact of the work had won him a strong reputation in Chinese art circles. 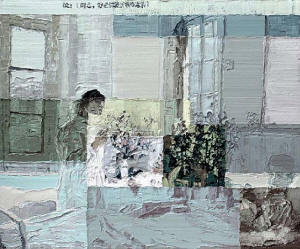 View Li Songsong paintings, biography, solo exhibitions, group exhibitions and resource of Li Songsong. View art online at The Saatchi Gallery - London contemporary art gallery.